​When I was five I passionately wanted to be an opera singer. Alessandra Wall Ph.D, Coach, psychologist, speaker, focused on figuring out “right for you” vs. right and thriving. ​When I was five I passionately wanted to be an opera singer. I came home everyday put on a good old fashion record and sang every song on that record at the top of my lungs. When I was 10 I really wanted to be veterinarian. I was so passionate about it that I asked my vet to sit in on a surgery. I passed out in the bathroom and hit my head against the wall — apparently I didn’t like seeing animals get stitched. By the age of 12 I wanted to be a baker and an entrepreneur. I started a profitable (my parents were covering the production costs) ​cookie business, selling upwards of 400 chocolate chip cookies a week, and later homemade blueberry muffins and donuts. I baked obsessively and perfected recipes for years. Then I was told that the food industry is a hard one to break into — my parents strongly encouraged me to be an engineer or a doctor. At 15 I decided I wanted to be a psychologist. I pursued undergrad and graduate studies, specialized in anxiety and child psychology, opened my own — now legitimately- profitable practice. I was passionate about making a difference in the lives of others and helping people feel in control of their lives. I formed a partnership with a colleague, we were hiring staff, building a group practice; things were on the up and up. Then at 35 I realized I didn’t want to do that for the rest of my life; I wanted to help people restore balance and live well, and be an entrepreneur, and do public speaking, and write, and have the freedom to work across the country and the globe. The problem with following your passion is that only 2/10 people actually have a single focused passion. The rest of us either have several things we are passionate about, or we’re still in the process of developing our passions. The idea that you will just wake up one day and know exactly what’s going to make your heart sing for the rest of your life is a crippling myth. 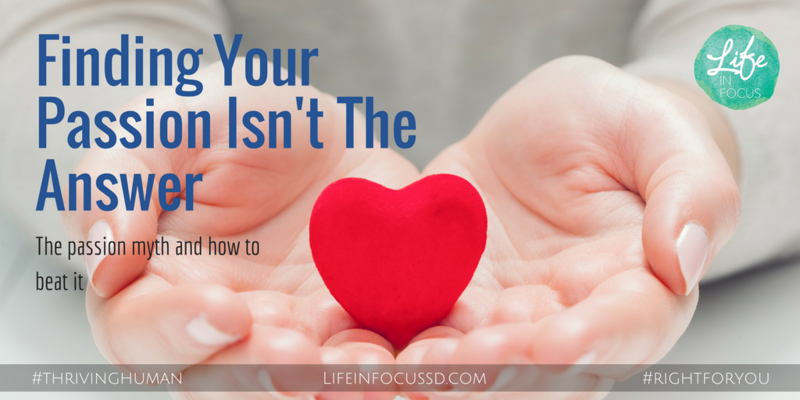 One that has left so many people either feeling inadequate — they’re just not really that passionate about anything yet — or thinking that they have missed their one opportunity to live a fulfilling and joyful life. Not only it is the idea paralyzing, it’s predicated on a fallacy. When it comes to passion recent focus and research is painting a more complicate picture. Passion isn’t something we innately have. It’s not manifest destiny. Passion is something you grow into. The great of the world (the ones whose passion we envy) didn’t wake-up one day imbued with an overwhelming motivation to pursue a passion. Rather, their stories tell us that passion grew from working through, persevering and honing skills for which they demonstrated some level of innate or acquired talent. And these skills weren’t blindly applied, but deliberately practiced in the context of something that naturally brought them a measure of joy or pleasure. In other words, Steve Jobs didn’t wake up at 22 to discover that he was passionate about changing the landscape of the world through technology. More likely Jobs discovered early on that he was really good a programing, and he probably derived great pleasure from problem solving and finding solutions. That pleasure would have helped motivate him through the harder, less rewarding parts of programing, and ensured continued practice and development of that skill. I believe that SKILL + PRACTICE + SUCCESS -> PASSION, and I’m not the only one to think this. A recent study (Chen, Ellsworth & Schwarz; 2015) at the University of Michigan polled people and found that a whopping 70% of them see passion as a bi-product of matching a rewarding skill with the “right” work environment; another 30% thought it was developed over time. More recent reviews of successful and outwardly passionate people reveals that most of us don’t even figure out what we are passionate about until well in our 40’s. By then we’ve had the time to practice, fail, try again, hone our skill, not to mention understand more about ourselves and our needs. Should you give up on finding your passion? For one, it’s incredibly invigorating and fulfilling to finally realize there are things that you’re gladly willing to fight for, push through and pursue even when the going gets tough. Secondly, the idea here is not that finding a passion is pointless, but rather that you don’t have to have it all figured out right now. You are not a fixed entity. Your development doesn’t stop in your 20’s. Actually, I’d argue that’s just the start of it all. The pursuits and ideas that drive you when you’re 25 are a great place to start, but it would be a mistake to believe that your interests and needs won’t change over time. It takes time to become good at something. It takes practice to become really good. It takes experience to figure out where best to apply your skills and talents, and passion seems to be a bi-product of all these things. I’ve always been good at taking care of others, listening and giving advice — did it with my family, did it nannying and babysitting from the age of 13 on, and I did it very well as a psychologist. Over time my skills improved, I have learned where my strengths lie and how best to apply them. Through the continued practice of these skills and a process of trial and error, it is only now, at age 39 that I have a really good sense of what I need to do to feel passionately about my everyday and my career. That doesn’t mean my life was unfulfilling, meaningless or devoid of joy before now. You don’t have to have it all figured out! Finding your passion isn’t the solution, it’s the culmination of a long process. Personally, I have no illusions that what drives me now will drive me in 30 years. More likely, it will evolve, morph and grow. I will fine tune this skill and continue to understand how best to apply it to maintain passion and fulfillment. Practice what you are good at, practice what you enjoy, and learn from that practice! Use what you’ve learned to fine tune a skill, or to modify how and where you practice it. It’s that kind of experience, patience and follow through that gets most people to a place where they can one day proudly announce that they have found their passion. Instead of trying to find your passion, work on figuring out what is right for you right now. Pay attention to yourself, to the things you enjoy and the things you don’t. Allow yourself to try, to try harder and sometime to give-up when it’s not working for you. Give up the notion that passion, talent or success come easily. The giants you look up to have been at their craft for a long time. Join me on Tuesday May 9th for a short 30 minute workshop on ‘Finding Right For You’. Come up with three actions you can focus on this summer to make a better everyday. Originally published at lifeinfocussd.com on April 30, 2017.